Tim Mullooly: Welcome back to Living With Money. This is Tim Mullooly. On today’s episode, I’m joined by John Schwartz, a correspondent for the New York Times. John has written on a number of different topics over the years, including business, science, law. He’s reported from a number of different locations all across the globe. I recently read the book, so I can personally attest to what Mr. Duhigg said. This book really is a pretty unique and informative journey, touching on pretty much all the main points of a person’s financial life. So with that, I want to welcome John onto the podcast. John, thanks for joining us. Tim Mullooly: You kind of outline this story in the book a little bit, but for our listeners can you give a brief background on yourself and how you got started writing for the New York Times? John Schwartz: Sure. I grew up in Texas on the Texas Gulf Coast, and I went to college in Texas. It’s not the classic what you think of as journalism career. I didn’t take a journalism course in college. I got my first job out of college at Newsweek, at a side publication of Newsweek called Newsweek on Campus into main Newsweek, and then moved over in 1993 to the Washington Post, where I was hired to be a science writer, and came over to the New York Times in 2000 as initially a technology writer. But it basically worked myself around the room to write about all sorts of other topics including business, the space program, the environment, and now I write mainly about climate change. Tim Mullooly: Right. And I also read that you write a humor column for investing on the Times. How did that get started? John Schwartz: Fifteen years ago, when the editor of the Mutual Funds Quarterly, which is now the Mutual Funds ETF Quarterly, came to me and said, “Can you write something funny? I need a better balance of stories in this section.” I hadn’t really thought about it much, but we joke around, we have fun. So I quickly wrote a little piece and he liked it, and his bosses liked it okay, and the next financial said “How about doing it again?” And so I created this column, which has now run, as I said, forever and ever, but is a ton of fun to work on, because it is both a chance to talk about serious things, but also to talk about them in a funny or silly way. On Sunday I had a piece about trade wars, and I talked about what it would be like for me to declare my own private trade war. One of the nice things about working at the New York Times is that if you call up someone like Austin Goolsby or Douglas Holtz-Eakin, who are both major economists who have led the Counsel of Economic Advisors and have been totally top economists in this country, and tell them that you would like to talk with them for a humor column, they don’t hang up on you necessarily. The columns are just tremendously fun. The interviews are fun. Writing it up is fun. And I sort of have this voice in the column of being a guy who thinks he’s brilliant and is not. Is really, really not. I play this out over a long time. Let me tell you, it’s a pretty nice break from writing about things like climate change, where there’s just not a lot of humor. Tim Mullooly: It was kind of the same thing with investing as well. It’s not traditionally a funny topic that people would think to have humor for, but it definitely is refreshing to hear some comedic takes on some of the investing topics that people talk about on a day to day basis, especially for us here as investment advisors. I always enjoy reading some comedy pieces about things that are otherwise known as rather serious topics. John Schwartz: Thank you. That’s really what I’m going for. The point of writing the book was that I was and have always been a little money phobic. I didn’t like thinking about my finances. I did some things right, I did some things wrong. But I would leave the Vanguard envelopes unopened on the coffee table, stuff like that. That’s not a great way to lead your life. I realized that a lot of the people I work with, a lot of the people I deal with on a day to day basis, share that aversion and don’t like to think about money. I had been making money funny for quite some time, and thought maybe there’s a way to do this at book length and actually reach people who otherwise would never buy a personal finance book, because they’re the ones who need it most. Tim Mullooly: Exactly. Yeah. A lot of people get intimidated by reading a traditional, preachy financial guide, and this definitely, this book is definitely not that. It’s more for the everyday person, and I thought it was a great way to try and get more people interested in reading about the topic. In the introduction of the book you tell the story you were alluding to earlier about your struggles with personal finance leading up to ultimately deciding to write this book. Can you share a little bit of that story with the listeners, and ultimately what got you to the point of needing to write this book and get your financial life in order. 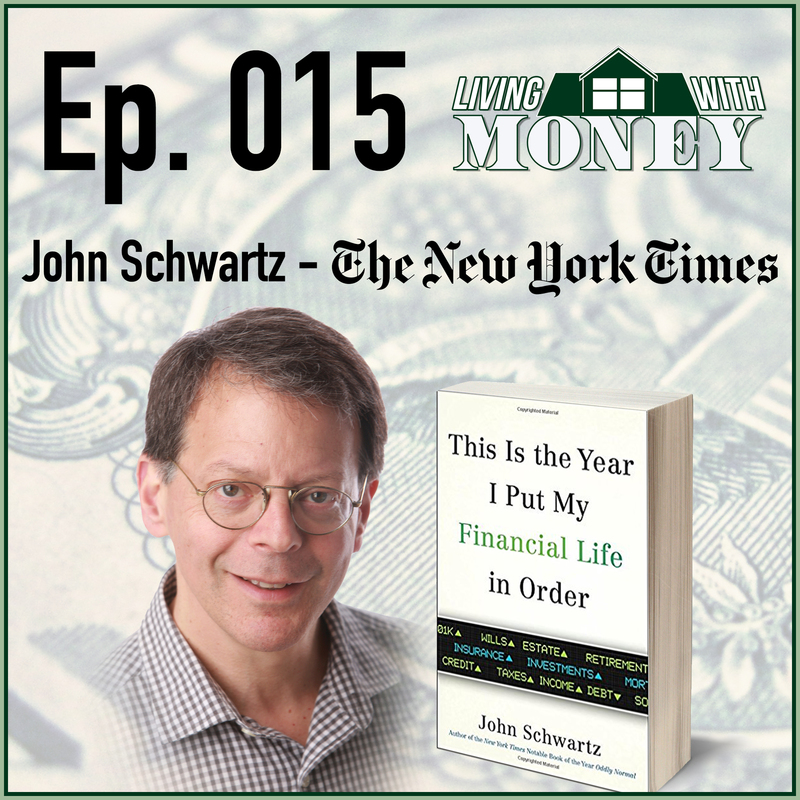 John Schwartz: I had, as I said, pushed away this thought of dealing with my financial life looking hard at my retirement plans, there were no plans, they were just sort of a 401K, I didn’t know what was in my pension, and every year the worry that I was leaving this too long was getting worse. Finally, around my mid 50s, it was getting bad enough that it was starting to overwhelm my natural tendency toward procrastination. What I realized was, I was close enough to retirement to be worried, but far enough away from retirement to maybe take action if I needed to. It was the tipping point, and I tipped. Tim Mullooly: I think for a lot of people – maybe you can agree with this – figuring out where to start in terms of getting things in line is the hardest part, because there’s so many different topics and different areas that you could focus on. Where do you think is the best place for someone to start when they’re trying to get their finances straightened out? John Schwartz: A lot of it depends on what age you are. If you’re young, like in your 20s, the place to start is by establishing savings, making sure that you’ve started a 401K or an IRA, started to put the money in. If you’re older, like me when I took stock, the answer is to see where you stand, to start with your retirement plans and take a look at however many legs of the traditional three legged stool of retirement planning you have. In other words, the three legged stool, as you know, is retirement savings and 401K or IRA, and then pension, and social security. Well, a lot of people don’t have pensions. A lot of people don’t have 401Ks, but whatever you have, you take a look at it. All those assets, including things like your home, what that might be worth, and try to figure out where that will leave you at the time you decide to retire. Let’s face it. The first question is a big stumper. When just don’t think that way. Tim Mullooly: Right. Like you said, that question is pretty hard for people to answer, and I think it’s something that gets pushed down the road farther and farther for people as the years go on. Would you say, just for people in general if they are younger, that it’s something that you should not really procrastinate on and take a hold of in your early years? John Schwartz: Absolutely. You have to be at least begin the planning and the saving, and do whatever you can to be ready to take that hard look when it comes time to do it. I think waiting until mid 50s to do it is late. It felt late to me. Other things that I’d left hanging were not just late but stupid. I didn’t have a will at 56. That’s just nuts. We had raised three kids. What would have happened to them if I had been hit by a bus? I urge people to assess early, look back, and be better than me. That’s one of the points of the book as well. I’m not holding myself out as a good example. In many ways I’m holding myself out as the guy you need to do better than. John Schwartz: That’s exactly the point. Tim Mullooly: The chapter about, it’s called Your Investing Primer. At the end you give a short punch list of four different points that you should focus on when taking stock of your portfolio. In terms of getting started with investing, what made you choose these four specific points? Vanguard questionnaire that I went through, put me through. That is to look at the 401K or IRA, to check that pension, to check social security, and then add up all the other assets to see where you stand. Those are extremely basic and straightforward ways to figure out where you’ll be in retirement, whenever that comes. But you don’t seem satisfied with that. Did you see something that you’d rather I’d have done? Tim Mullooly: No, I thought that they were really good points to start on. I was just curious as to, there are so many different points could be tackled there, I was just wondering how you focused in on those four specifically. John Schwartz: Well, I’m not a subtle person. They seemed the most obvious to me. But of course, what did I leave out? I left out how much are you saving, is there a way for you to save more? No matter what you’re doing, you can probably save more than you’ve been saving, because many, many people have no retirement savings at all, and it’s not that hard to start, even if things are a little tight. If you can go to the trouble of setting up the account and assign one percent of your income to it, unless you’re truly, truly squeezed that one percent shouldn’t sting. And then you can set that up from there to increase by a further percentage of your income every year after. Again, you would hope that as that happens, you might be getting raises, you might be doing a little better. Within a short number of years, you’ll be saving 10 percent of your income a year, and I would hope not feeling the pinch too badly. If you can do that and be in much better shape at retirement, no matter what’s happening. Tim Mullooly: Yeah, I definitely agree. Those points are definitely great to start with. Like you were saying, we hear a lot from people that getting started saving is difficult for them, and they think even if it’s a small amount of money, like that’s not going to make a difference in the long run. But like you’re saying, even if it’s only one percent of what you’re making, it’s better than not saving anything at all. So I agree with you. Getting started is definitely one of the most important things. John Schwartz: Especially when that one percent is one percent of your income that gets invested in something that is probably going to grow, so that it’s not just one measly percent of your income, it’s one percent of your income invested. Tim Mullooly: Exactly, and it has the opportunity over the long term to compound and make more money for you down the road. I definitely agree with that. It’s not just a stagnant one percent that you’re putting in. The opportunity for growth is really, obviously, the biggest upside in investing. In the chapter of the book you talk about the different types of how you can get advice. You gave a couple different examples of people that you met with, from brokers to advisors. With so many different types of financial professionals out there, how can someone be sure that they’re picking the right advisor or broker for them? John Schwartz: If you’ve got a broker who you trust, and who is highly regarded, and who friends and family believe in, and you want to go with that person, that’s great. The problem with brokers is that in most cases they first of all, they’re trying to sell you something. They might have a financial interest in what they and they are not generally obligated under the law to have your best interest first at the top of their list. They might give you decent investments, but they might not be the best for you. And that’s a problem. If you’re going to go with a broker, then you need to talk with them, find out what those possible conflicts of interest are, find out whether they get paid more to move you into their company’s investments, or if there are incentives for them in choosing this over that. There are a lot of potential conflicts there. They might be nice people, but they still might need that beach house. And I know terrific brokers, so it’s not a knock on everybody in that field, but it’s easier for me to have trust in people like certified financial planners, whose fiduciary duty is part of the job, and who will either advise you in a general way under contract or even set up an hourly rate to attack specific problems. But whoever you deal with, you’ve just gotta ask very tough questions. These are the kind of questions that we don’t feel any compunction about asking if we’re buying a Honda. Dealing with a human being, we sometimes get a little nervous about sounding rude. It’s a good time to be direct, because you’re protecting your investments. John Schwartz: Where are the customer’s yachts? John Schwartz: It’s one of the great questions. And you’re right. The Obama administration had come up with a plan that they had been drawing up over years to apply fiduciary responsibilities to brokers. But the Trump administration came in and have really slow walked that and might be getting rid of it. It’s hard to say what’s going to happen there. But until there’s decisive action, it’s up to you to protect yourself. Tim Mullooly: We’re trying to tell people that brokers, like you’re saying, not all of them are bad, but it is necessary to ask the questions if they have this fiduciary standard, because I think that’s probably one of the most important things you can ask when deciding to work with someone. Are you on the same side of the table as me? Do you have my best interests in mind? Some of these big firms have just essentially argued in court that they are salespeople, and they shouldn’t have to be held to the same standard. I think through books like this and just reading online that educating the everyday person on the fact that there are a difference between brokers and advisors and a fiduciary level of responsibility is one of the biggest obligations that we have to our clients at this point. John Schwartz: I’m not saying that the reader is dumb or that the broker is bad, but we have all had the experience like I had when I was in my 20s and decided that I really wanted to buy something nice for myself. I wanted to buy boots at a fancy Texas boot store. I walked in and the woman who was selling me the boots really wanted to make the sale. And I wanted something great, but I wasn’t all that experienced. I hadn’t really worn boots. The boots she sold me were too tight. I said, “These feel a little tight.” She said, “It’s a very light leather, it’ll stretch. These are going to be the most comfortable boots you ever had.” She was pushing me on these boots that were a little odd color, but I liked the color, it was kind of oxblood. And she just focused in directly on both my insecurities and my need to get something special. Look, I’m the one who bought the boots. I’m the one who signed the check. I’m the one who spent several hundred dollars, and I’m the one who let them sit in a closet unworn for years because they actually were too small. We’ve all been taken one way or another, but this was a few hundred dollars’ worth of boots, okay? This was not my life savings. Tim Mullooly: Right. When it gets up to dealing, like you’re saying, with someone’s life savings, I think there needs to be some sort of obligation to at least level with people and say, “I don’t have this sort of fiduciary standard.” Like you’re saying, it’s not all of them are bad or misguided in their recommendations, but I think it is, they should be on the level with people at least when you’re dealing with such significant amounts of money. Tim Mullooly: Apart from this fiduciary standard, there’s another pretty big problem in today’s world, and that’s debt. You hear more and more about people taking on ridiculous amounts of debt, whether it’s student loans or other types of credit card debt. People just in general have trouble properly managing their debt, and trouble digging themselves out once they get in. What would you say would be the first step for someone who’s trying to get out of debt? John Schwartz: As with savings, the first step in getting out of debt is starting. Instead of letting it weigh on you, worry you, you make a start. I’m not moralistic about debt. Debt creeps up on us for all kinds of reasons that might have nothing to do with lifestyle choices. I’m not one of those people who says, “Oh, you shouldn’t buy that iPhone” when a phone is an essential part of life, employment, family communication. What I say is find your debts and work them down as best you can. The real debt maven out there is Dave Ramsey. He’s hyper focused on debt, and he recommends, as a lot of people do, what he calls the snowball method, which is that you look at all your debts and you pick the smallest one, like the smallest credit card bill, or the tail end of a car loan, and you work to pay off that loan first. He says it’s not because … In my sort of logical way of looking at things, I would say pay down the debt with the highest interest rate. You’re burning money on that interest rate. Dave Ramsey’s point is [inaudible 00:23:08] the smallest debt because you can. Once you’ve knocked down that first debt, you will get a rush feeling of accomplishment, and you’re going to want to have that feeling again. So pick them up, knock them down. Pick them up, knock them down, working through all your debts. It’s a system that works for many people. I don’t care if you take on the highest interest debt or the smallest debt. If you don’t start, nothing happens. Tim Mullooly: I think that’s a huge point. You gotta do something. For people I think taking on the more manageable types of debt, like you’re saying, the smaller amounts, it gives them that sense of accomplishment and that they’re actually making progress, because everyone likes instant gratification. They can actually see that debt disappearing, whereas with a larger debt, it might take them a longer period of time, and they might feel like they’re not making any progress. John Schwartz: Right. If you’re chipping away at it, it’s just psychologically nice to get the gratification of seeing something happen. Tim Mullooly: Yeah. Absolutely. So kind of tied in with debt is the cost of college. That seems to be weighing heavily on parents’ and kids’ minds lately with the cost constantly going up. For parents or kids looking to go to college, what would you say is probably the best way to go about saving for college? John Schwartz: The worst way is to try to pay it on credit cards or to try to pay it out of your checking account, which some people do. There are better ways to go. A lot of states offer these 529 plans that let you put the money away. There are other instruments that let you save money by investing it as you would a 401K and get some income off of it. The point is to have something that you put the money into on a regular basis, and it is safe. The 529 plans have tax advantages for you, so you win both ways. And look, when your kid gets to college, it’s going to be far more expensive than you thought it was, and what you thought you were saving for four years might be gone in the first year. That happens. But you took care of the first year, which is huge. We cobbled together some savings and other things to get our kids through school, and then when it ran out, we went to debt, and we built up debt. When our two older kids were out of college by the time we were really in trouble with that debt. We had something like $100,000 hanging over our heads with the monthly payment. It can be very hard, but you sort of make your own bed there. If we had saved more, we would have had less debt later. Ultimately, my wife said this debt now is this house. The market was starting its upswing after the financial crisis, and we had a large house in a town that was on the way up, and we were able to sell that for enough to pay off that college debt on the first two kids. It was wiping the slate clean was a huge deal. To get back to your very first question, or your second question, that was also the moment with the slate clear and no big debts weighing us down, it was a little breathing moment for us. So I was able say I really should look at where I stand for retirement now. On top of everything else, that moment of selling off the house put us in a position to move on and take on the planning. Tim Mullooly: That’s awesome that it was able to work out like that for you guys. I feel like main topic that we’ve been touching on a lot of these different areas is just to do something and to get started, whether it’s saving money for college or chipping away at debt, taking stock of your portfolio. I think just getting started and actually doing something is probably the biggest thing that you can do for yourself. Would you agree with that? John Schwartz: Yes, absolutely. There’s a saying that is often referred to as a Chinese proverb. I don’t think it’s a Chinese proverb but it’s pretty good, which is the best day to plant a tree is 20 years ago. But the second best day to plant a tree is today. Tim Mullooly: Right. Ultimately, after writing this book, if you could – there are so many different topics that you touch on in the book – but if you could have your readers take one thing away from this book, what would that one thing be? John Schwartz: Thinking about the person I’m trying to reach with this book, and that person is a procrastinator, a little afraid of money, sort of emotionally wrapped up in money the way many of us are, that what I’d like to tell them is you don’t have to be scared. You can take a good, hard look at this. It’s not going to kill you. It won’t even hurt. It’s not necessarily easy, but it’s straightforward. That’s the goal of the book is tell people to start. Tim Mullooly: Like I said before, that’s a great lesson to give people. For you personally, what was the most rewarding thing about writing this book and going through this process? John Schwartz: Each one of these things I ticked off my list, getting the will, getting my life insurance, thinking about these things. When I talk about, and you talk about that gratification moment of having checked something off the list, doing each of those things and actually feeling like I’d accomplished something was like a drug. It was just wonderful. At the end of the process, I was less worried, not because I had turned around my financial life, but because I had come to understand it. Not because I knew everything about money now, but that I had learned enough through the research. That’s the experience I want to try to give people. Tim Mullooly: Right. And like I said before, and you’re alluding to as well, it kind of is an intimidating topic for some people, and they just don’t know a lot about it. I agree, going through this process is definitely a good way to not necessarily make yourself a complete expert, but at least educate yourself a little bit more and just understand where you’re at in your own personal financial life. I think that this book is definitely useful for people getting close to retirement who might be unsure about where they’re at, or even from myself, I’m a young, in my mid 20s. I think this applies for people just getting out of college as well. Want to say really good job on touching all of these different topics for a wide range of people. John Schwartz: Thank you very much. Tim Mullooly: Okay. One last question before we wrap up here. First, like we said in the beginning, the title of this book is This Is The Year I Put My Financial Life In Order. In the show notes on our website, I will link to where you can find the book on Amazon. If you have been listening and any of these topics apply to you, definitely go pick up the book. I highly recommend it. One last question for you, John, before we let you go. We like to ask this to all of our guests. How would you define being wealthy? John Schwartz: I think it would mean not having to worry about whether to get the little sous vide egg bite at Starbucks along with the coffee. It’s in not having to worry about the little purchases on top of the other things that you would normally get. That would make me feel extremely wealthy to not be dogged by the little worry that, “Should I do that? Should I do that?” I’m not talking about going to Hawaii. That’s really wealthy. But to me the feeling of being wealthy is not having to worry about every little purchase, and for years I was in a very tight spot. Wealth is more a state of mind than a number in your account, and being freed of the 20 moments of worry during your day is wealth. Tim Mullooly: Definitely have to agree with that. If you read this book and touch on all the different topics and take care of some of these issues of debt and your portfolio and stuff that John touches on in the book, I think you might find yourself a little more wealthy than you thought you were before reading the book. So kind of tying it all in together. John, thank you very much for coming on the podcast today. I really appreciate you taking the time. John Schwartz: Tim, thank you very much. Tim Mullooly: If you’re listening to this on iTunes, please subscribe to the podcast to get new episodes every week, and feel free to leave us a review or a comment, because it would really mean a lot to us. Be sure to follow us on Twitter and Instagram @lwm_podcast for more news and updates about the show. That’s going to do it for this episode of Living With Money. Like I said, that was John Schwartz, a correspondent for the New York Times. The book again is called This Is The Year I Put My Financial Life In Order. If you need to get your financial life in order, definitely go pick up a copy. We’ll link to it in the show notes like I said before. That’s going to do it for this episode. Thanks for listening, and we’ll see you on the next one.